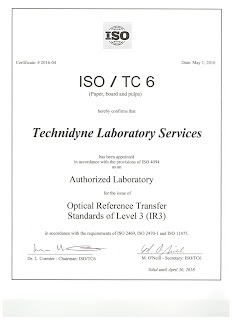 Technidyne is a US-based, family-owned company working to make products, calibration standards and providing services for the worldwide Paper & Allied Industries. Technidyne will post industry and Technidyne related information on a regular basis. We invite anyone to join the blog and hope that those who read it find it informative and useful. Thanksgiving in the United States gives us a chance to reflect on all the things we are thankful for in our lives. We can reflect on the history of the country and be thankful for the sacrifices and ingenuity of those that came before us. We can reflect on our jobs and the great people we interface with: coworkers, customers, vendors, and agents. We can reflect on our family, friends, faith and blessings all around us. We all have a lot to be thankful for. The hard thing is to take time to think about it and then to actually say, "thank you", out loud to those that have helped us achieve out position in life: spouse, parents, friends, kids and God. So many of these old ways of doing things have changed or have totally disappeared over the last 10-20 years. required some specific test parameter or requirement, the equipment was purchased. 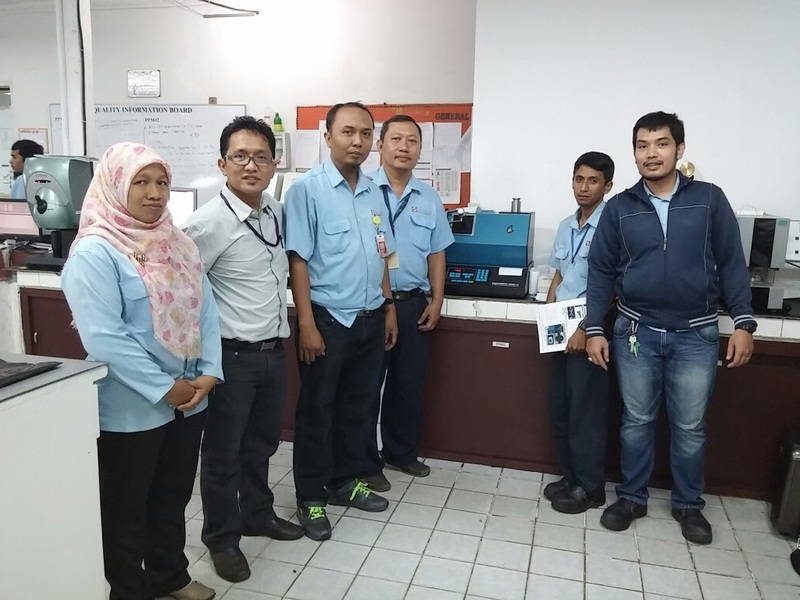 Full-time employees were hired and trained on the calibration, operation and maintenance of each piece of test equipment. Several testers on each shift sat in the lab. They prepared samples for testing after each turn up or batch. Each tester would run a series of tests on the samples that were prepared. That system and process has changed dramatically for many organizations. It is continuing to evolve around the globe for others. Most have automated all or at least part of their laboratories. Automation gives more data in a much shorter amount of time. CD, MD, top and bottom measurements can be made in a manner of seconds with automated equipment. At the same time, the real variation in the system can be seen because the automated testing removes any effect of the tester. Many know that testers can effect the results by manually changing data, accidentally entering the wrong data, searching for the best data by manipulating the sample, accidentally damaging the sample, etc. Automated testing removes these factors from the data and provides significantly more detailed information more quickly and electronically. If the decision is made to automate, there are different approaches available. The big-box automation is where a large, fixed-size system is purchased with a significant cost for the "bed" and at the same time any number of tests (usually 1-8) are purchased at the same time. The cost is usually quite high (US$500k to over US$1M) and depends on the specific tests and the total number of modules. In many instances modifications to the existing laboratory are required to accommodate the size (10 ft. x 3 ft. x 5 ft.) of the device. This is an additional expense. Ongoing preventative maintenance and service work is quite high (US$30k+ per year). In the case of modular automated testing, each test has the same footprint (11 in. x 15 in. x 24 in.) and the modules are priced slightly higher than a normal stand alone instrument because they have the feed mechanism and software for automation built-in. The cost is usually quite reasonable (US$15k to US$350k) and as the big-box system, depends on the specific tests and the total number of modules. However, there is no need to modify the existing laboratory to accommodate the modular automated testing system. Ongoing preventative maintenance and service work is much lower than the big-box and is based on the number of modules in the system. 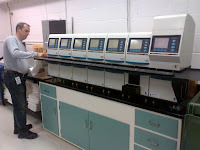 Choice of big-box automation, modular automation or stand alone testing equipment for lab varies with different factors. Understanding these factors helps in deciding which path to take with equipment. Some factors and the rationale behind it at different scenarios are given below. A modular automated system is the best option when an older automated system is being replaced. This is the case when the bigger dollar figure of a big-box system is going to make ROI/payback difficult over a 1-3 year period of time. When personnel reductions are not possible or practical, and smaller operational efficiencies will be achieved through automation, a modular automated system is preferred to get ROI/payback one piece at a time (6 months - 1 year per module). If budgets do not allow for large expenditures at one point in time, but it does allow for smaller purchases each year, a modular automated system or stand alone testing would make sense. If the expected usage of the equipment is more than three years and its frequency of usage is high, big-box or modular automated testing is suggested, provided the need to upgrade the equipment is low. If the expected usage of the equipment is less than three years or the product mix/grade structure of the facility is likely to change in the future acquisition of a modular system is suggested. 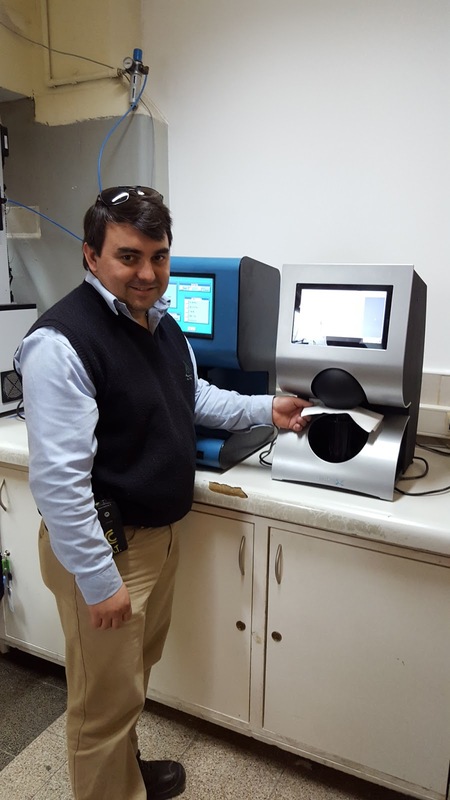 Stand alone testing is preferred if the equipment will be used for a short term and its frequency of usage is low. 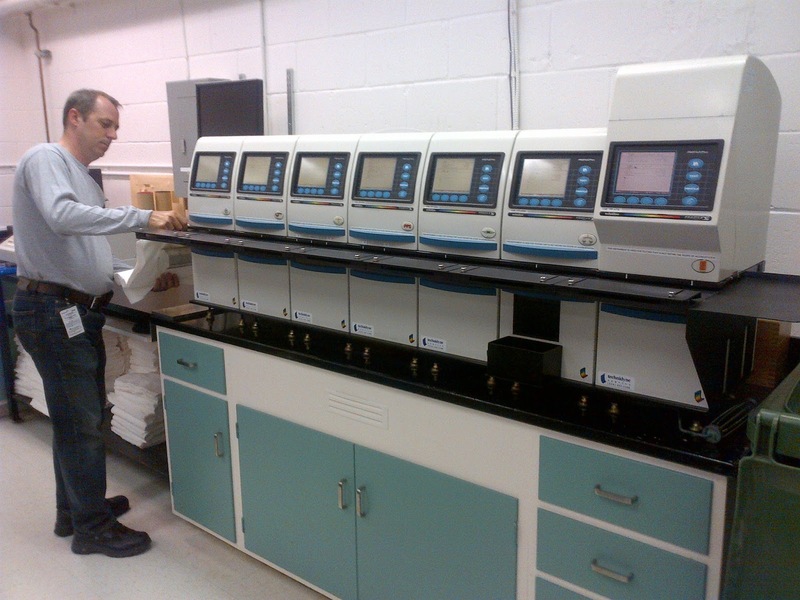 Regulations and technology developments will require upgrading lab equipment regularly. High-end equipment that involves high technology is subjected to a high rate of change in technology, which results in regular upgrades. It is preferable to acquire equipment with a low to moderate need for upgrades through big-box or modular automated testing, as acquiring equipment with high upgrade requirements could result in owning obsolete equipment. It is preferable to procure equipment associated with frequent technological changes and frequent upgrades in a modular automated testing system or stand alone, as it is easier to upgrade and avoids owning a big-box system with obsolete equipment. Stand alone equipment is suitable for all types of users irrespective of the industry or size of the company when the technology is changing frequently and there is a need for constant upgrading of the equipment. It is preferable to acquire big-box or modular automated equipment for medium to high frequency of usage tests, as return on equipment is high because the cost of the equipment is spread over the hundreds or thousands of tests. 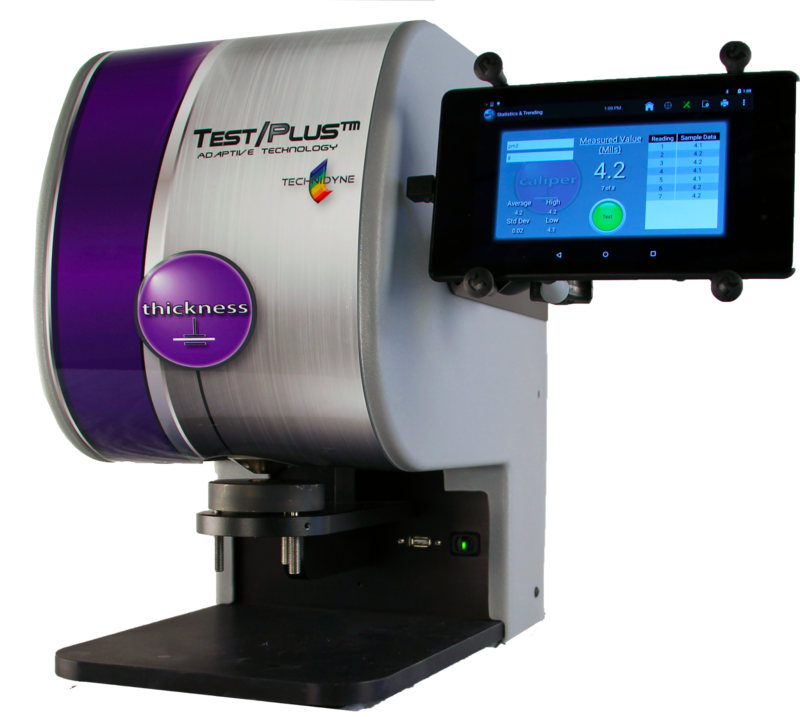 Stand alone testing is preferred for equipment that is used less frequently or by ad-hoc requests. Acquiring equipment for temporary usage incurs more cost and less return. If equipment is going to be used very infrequently, paying for testing by the manufacturer or a testing lab has become an option. Big-box automated systems do not have all tests according to the applicable international testing standards, therefore, correlations are used for many tests. Modular automated systems offer standard testing just like stand alone equipment. 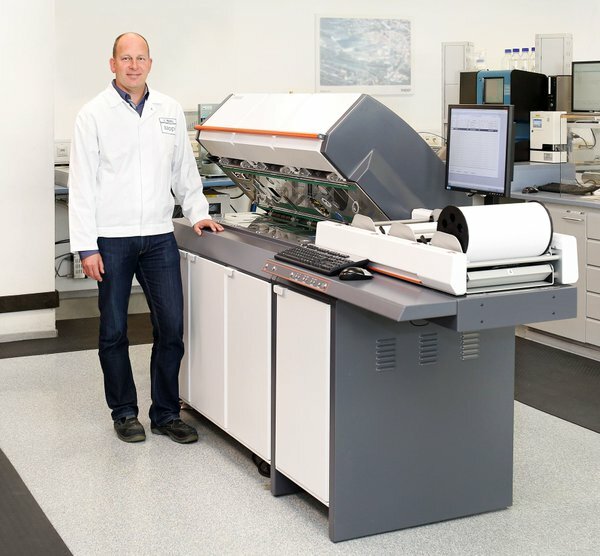 Automation has become a normal part of today's testing laboratories. There are many factors that can help determine what version of system is best for your situation. Careful consideration must be given to determine how to bring the benefits of fast testing with more relevant data (MD, CD, top, bottom) to the production facility. Contact me with other blog ideas. In the month of October, Technidyne Corporation had its second highest single month revenue in the 42 year history of the company. In lieu of the upcoming Thanksgiving Holiday in the U.S., thank you to our employees for fulfilling their roles in such a way to help Technidyne reach this milestone. 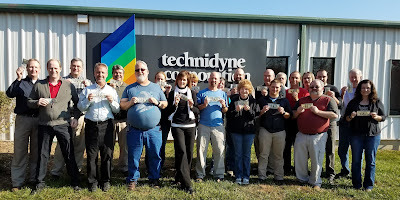 Each employee received a $100 bill to commemorate this special event and their commitment to our customers, to teamwork and to the continued success of Technidyne Corporation. Laboratory equipment was always purchased 20 years ago. Wow, how that has changed. Nearly every discussion with a customer involves payment and financing options. Everything from buying equipment outright to leases and rental and even payment per test have been discussed. 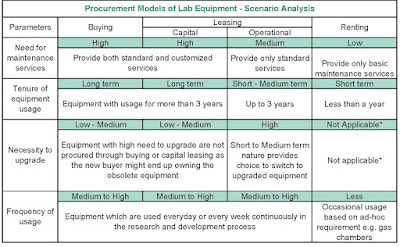 Choice of procurement models for lab equipment varies with different factors. Understanding these factors helps in deciding whether to own the equipment, which in turn helps in choosing the right procurement model. A preferred procurement model and the rationale behind it at different scenarios are given below. Customized services are necessary for end users who are into research and development in order to carry out their operations to the desired specifications. If the equipment needs a high degree of maintenance services, buying or capital leasing is preferred, as these options offer not only standard but also customized maintenance services. An operational lease doesn’t usually offer customized maintenance services, as the equipment will be returned to the lessor after the lease term. As the service contracts in renting are high-priced and the equipment is being used by many people, it is advisable to obtain equipment that requires less maintenance. If the expected usage of the equipment is more than three years and its frequency of usage is high, acquisition either by capital lease or buying is suggested, provided the need to upgrade the equipment is low. If the expected usage of the equipment is less than three years and ownership is not desired, acquisition through an operational lease is suggested. A rental option is preferred if the equipment will be used for a short term and its frequency of usage is low. 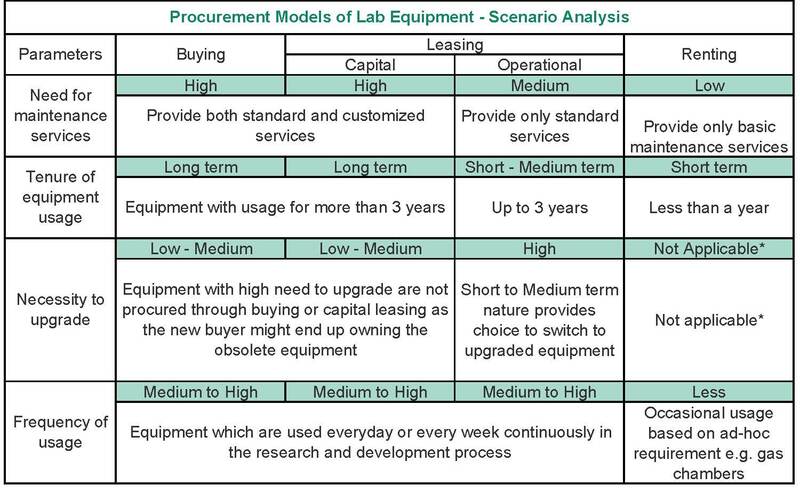 It is preferable to acquire equipment with a low to moderate need for upgrades through buying or capital lease, as acquiring equipment with high upgrade requirements could result in owning obsolete equipment. It is preferable to procure equipment associated with frequent technological changes and frequent upgrades under operational lease, as it avoids owning obsolete equipment. Operational leasing is suitable for all types of users irrespective of the industry or size of the company when the technology is changing frequently and there is a need for constant upgrading of the equipment. It is preferable to acquire equipment for medium to high frequency of usage through buying or leasing, as return on equipment is high because the cost of the equipment is spread over the years of usage. Renting is preferred for equipment that is used less frequently or by ad-hoc requests. Acquiring equipment for temporary usage through buying or leasing incurs more cost and less return. 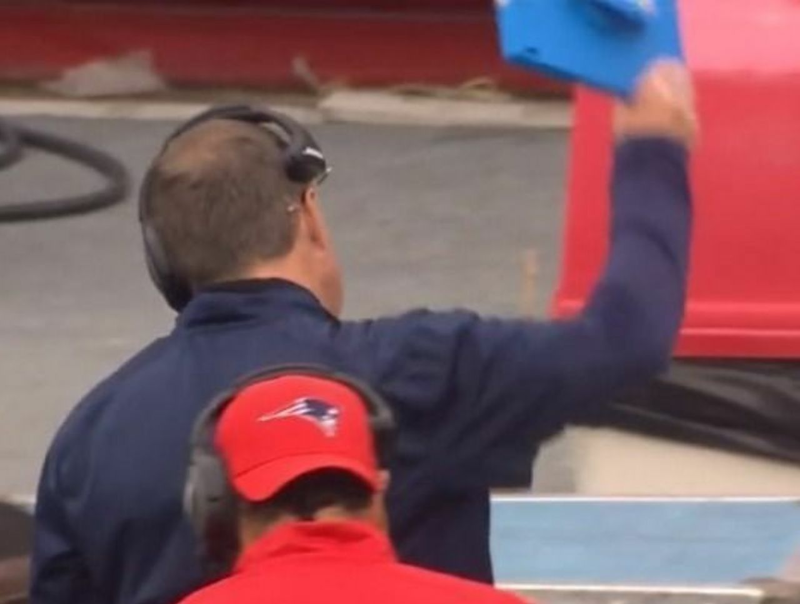 We agree with Bill Belichick of the New England Patriots - Paper is an awesome product! Back in 2014, Microsoft struck a deal to supply the NFL with Surface tablets as a coaching tool. I am sure it has many benefits … but seeing the video of Bill Belichick throw down his Microsoft Surface tablet in frustration made my day! I feel his pain and have often felt like doing the same with my laptop or smartphone on many occasions. Bill’s reasons for chucking the tablet are no surprise - he said that the technology failed him and made his job harder because it was too undependable and inconsistent. He is going back to simple, functional, renewable and recyclable PAPER! James C. Abbott, Cincinnati, Ohio, passed away Sept. 29, 2016. Jim seemed a bit unassuming. He looked a little like Mr. Magoo. However, if you talked to him at all you realized he was more like Donald Trump. He never had an opinion or thought that he did not express. The type of action Jim reveled in was either teaching a "youngster" at Proctor & Gamble a thing or two about tissue at their facility in Cincinnati, OH or discussing and debating the merits of different test methods and evaluations for tissue products and their applications. He loved a good debate. At times he seemed bored if there wasn't some kind of controversy to be debated. He was employed by the Procter and Gamble Company for almost 30 years until he retired in 1994. However, he stayed very active in TAPPI (Technical Association of the Pulp & Paper Industry). 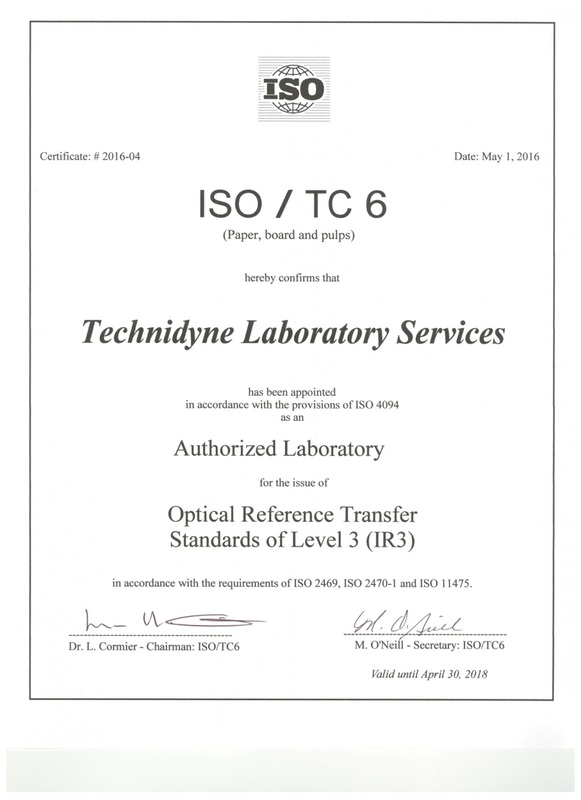 and ISO (International Standards Organization). His research and testing interests were in tissue products. This isn't the type of dinner-time conversation that brings flocks of followers and invitations to speak at university functions. However, this seemingly grumpy individual possessed a treasure trove of knowledge when it came to the history of testing methods and standards related to the Paper Industry. Once you were on his radar, he could easily explain the history of different tests, their inception, changes that occurred, and why these changes were made. He would also give you the unfiltered version of how these things evolved, whether motivated by geographic politics (Europe vs. North America) or sound technical considerations. Jim was a tireless volunteer in this respect. He was involved in ISO, TAPPI, ASTM and other standards organizations. He selflessly volunteered to review many standards when no one else would do so. He was a great asset in this regard including being Chairman of the U.S. TAG (Technical Advisory Group) to ISO TC 6 (pulp, paper and paperboard). He also initiated the first Working Group within ISO for Tissue Properties, which still exists today. Those of us who worked with him over the years will miss so many of his eccentricities, funny comments, appreciation of a nice adult beverage, technical prowess and sheer knowledge in the area of testing related to the Paper Industry. Farewell, Jim Abbott...you will be missed! 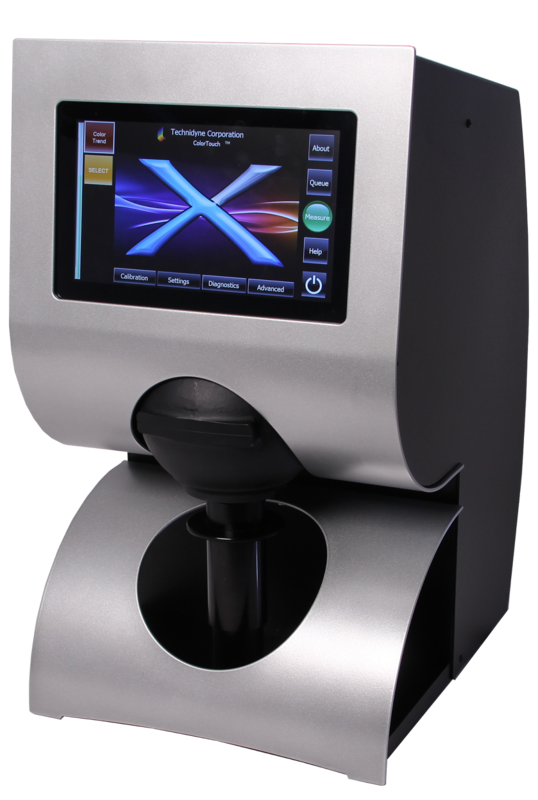 The Technidyne Color Touch™ X, the latest in the family of spectrophotometers specifically for the Pulp & Paper Industry, was released in mid-2015. Among early adopters of the newest technology for optical measurements in the Industry are seven customers in Taiwan. Asia has been a strong market for products like the Color Touch™ PC and Color Touch™ 2. The early movement of Taiwanese customers to the new technology is a sign of confidence in the products that Technidyne provides and the interest level in those customers to stay with the newest technology on the market. All of this is backed up by the most knowledgeable team with specific expertise related to the paper industry, it's applications, requirements and customers. Check our our website on how to step up like so many customers around the world. Also, see CalStandards.com to see how you can order standards and parts for your lab. CHICAGO (September 22, 2016) - Today, Two Sides North America, Inc. confirmed that over 65 leading North American companies have removed inaccurate anti-paper claims as a result of the group’s efforts. The list includes several Fortune 100 companies in the financial, telecom and utilities sectors who have engaged in a dialogue with Two Sides and modified their marketing messages to consider the social and environmental benefits of print and paper, as well as the life cycle of sustainable forests and paper products. Recently I attending the ISO TC6/SC2 Working Group 34 on Flat Crush Resistance. I learned quite a lot. Here are a few items. Source: Scott, Tosset, "Properties of Paper: An Introduction", TAPPI Press, 1989, 143. 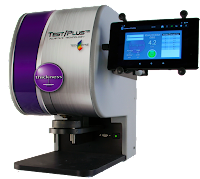 All TEST/Plus devices have basic measurement capabilities for a budget-friendly price. Additional features can be added by purchasing applications for your particular needs, including: statistics, print, export and database. The Technidyne PROFILE/Plus Thickness (Caliper) has been available for over 15 years. Step into something modern, something inexpensive, something easy to use and something new. What other TEST/Plus devices would you like to see? 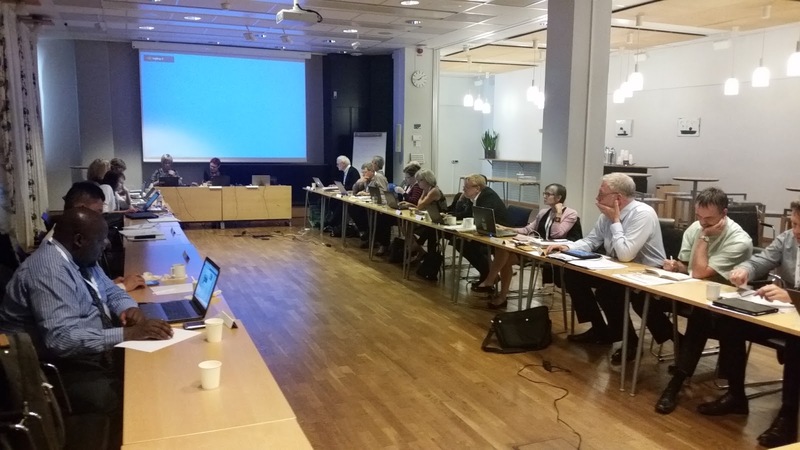 There was a lot of discussion last week at the ISO TC6 meeting in Stockholm about cellulosic nanomaterials. See this video for some information from FPInnovations (Canada). Nanocellulose is a term referring to nano-structured cellulose. This may be either cellulose nanofibers (CNF) also called microfibrillated cellulose (MFC),nanocrystalline cellulose (NCC), or bacterial nanocellulose, which refers to nano-structured cellulose produced by bacteria. CNF is a material composed of nanosized cellulosefibrils with a high aspect ratio (length to width ratio). Nanocellulose/CNF or NCC can be prepared from any cellulose source material, but woodpulpis normally used. The nanocellulose fibrils may be isolated from the wood-based fibers using mechanical methods which expose the pulp to high shear forces, ripping the larger wood-fibres apart into nanofibers. 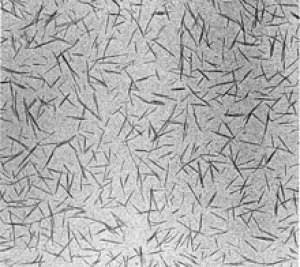 Crystalline cellulose has interesting mechanical properties for use in material applications. Its tensile strength is about 500MPa, similar to that of aluminium. Its stiffness is about 140–220 GPa, comparable with that of Kevlar and better than that of glass fiber, both of which are used commercially to reinforce plastics. Films made from nanocellulose have high strength (over 200 MPa), high stiffness (around 20 GPa) and high strain (12%). Its strength/weight ratio is 8 times that of stainless steel. There are proposed uses for cellulosic nanomaterials in cosmetics, medicine, paint, plastic and other applications. 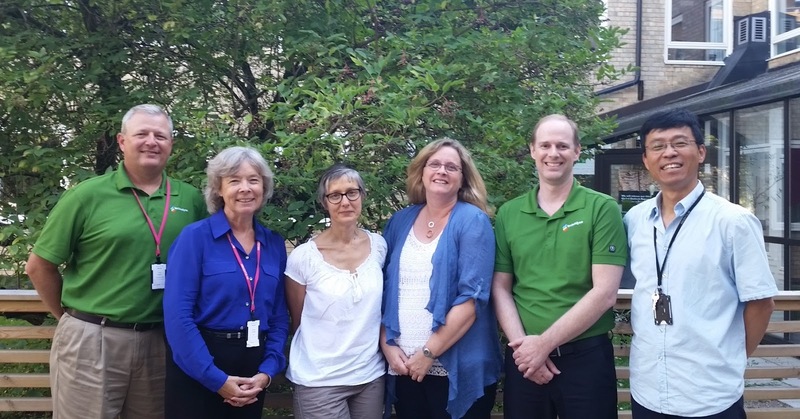 ISO TC6 (paper, board and pulp) is meeting in Stockholm, Sweden this week to review, update and issue International Standards for use throughout the world. 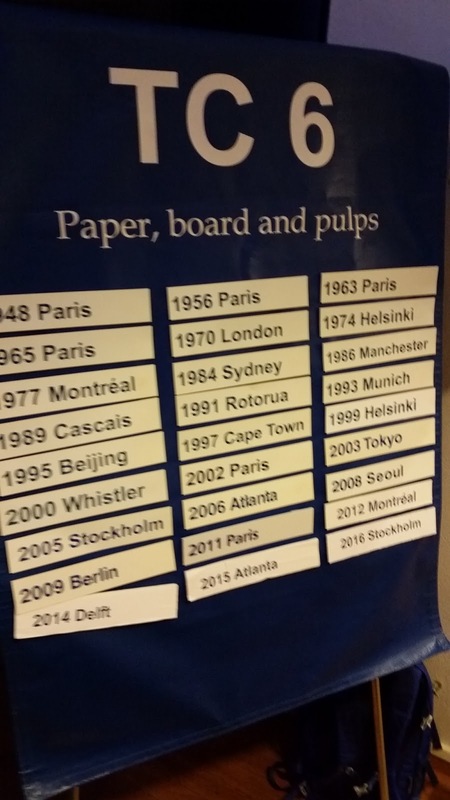 Thursday's agenda included all items under TC 6 which is a committee on "Paper, board and pulps". In this meeting the attendees sit with their country delegation. This meeting involved a review of the activities in the appropriate working groups and approval of official resolutions to on actions to be taken within TC6. It was announced that the next meeting of ISO TC6 will be in Korea in the Spring of 2018. The week of meetings wrapped up with a visit to Skansen, an open-air museum in Stockholm with a zoo, aquarium, food, houses and acts that portray the Swedish history and culture. If anyone is interested in participating in TC6 or any relevant Working Groups or Standards, please contact Todd. Wednesday's agenda included all items under SC2 which is a committee on "Test methods and quality specifications for paper and board". In this meeting the attendees sit with their country delegation. This meeting involved a review of the activities in the appropriate working groups and approval of official resolutions to TC6. These resolutions require action on behalf of the group. 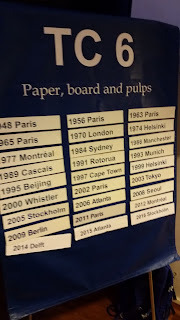 ISO TC6 (paper, board and pulp) is meeting in Stockholm, Sweden this week to review, update and issue International Standards for use throughout the world. There are also some CEN (European Committee on Standardization) meetings being held at the same time. If anyone is interested in participating in these areas, please contact Todd. 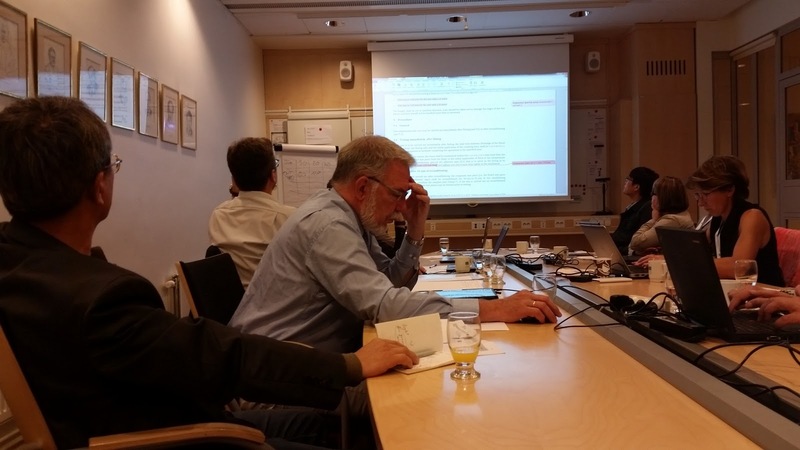 ISO TC6 (paper, board and pulp) is meeting in Stockholm, Sweden this week to review, update and issue International Standards for use throughout the world. The meetings are being held at the Swedish Standards Institute (SIS). ISO OPAL Group - What is it? 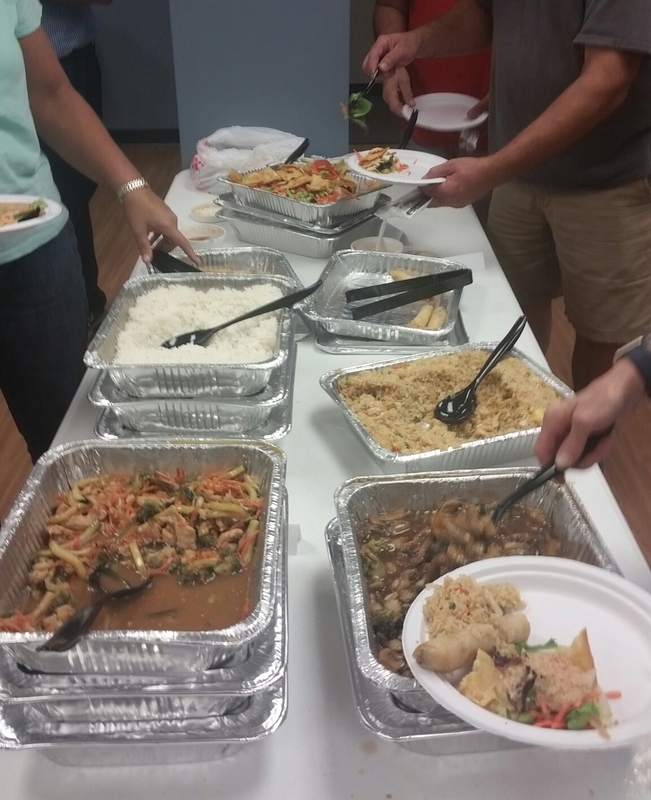 In order to maintain a high level of agreement among the labs, they participate in monthly inter-laboratory comparisons. This means the labs produce and ship standards to each of the other labs each month. They read the standards that were received and generate a series of tables showing the monthly comparisons of spectral reflectance (minimally 400-700 nm), fluorescent (UV Level D65 & C) and non-fluorescent levels.. This data is then maintained on a common website for later analysis. This aids the labs in detecting differences or changes among the group. In regularly scheduled meetings (like the one in Stockholm), each lab reports and discusses any observed trends, changes or differences. This helps build a cohesive group for issuing standards. The idea is to provide the best agreement among customers that receive standards from any of the Authorized Labs. 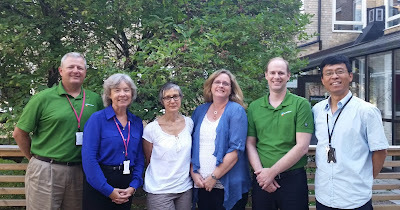 A new report will be issued by the OPAL in the near future which illustrates the inter-laboratory reproducibility. What is TSI Area and how is it used? 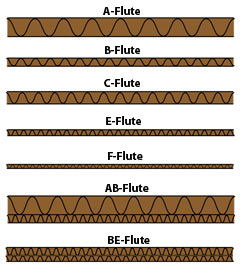 Most are familiar with the "peanut" ellipse the is produced from ultrasonic fiber orientation measurement devices. It is a numerical approximation used to transform the data into a polar diagram. The area of this polar angle plot is the TSIArea . With a well adjusted head box, the TSIArea is used to measure the influence of a change in jet-wire speed difference or pressure changes in the head box. When comparing TSIArea in one running condition to another, a fiber quality index can be used to more easily explain the reason for the change. Ideally, the operator of the device will enter the TSIArea(target) value based on statistically relevant measurements and the goals of the operation. When the sample is measured, both the TSIArea(measured) and the "fiber quality index" (ratio shown below) are displayed. Technidyne has been selling fiber orientation measurement devices and helping people with their use of this technology for over 20 years. If you have experience using TSIArea, please share it here. A 10-module, PROFILE/Plus™ test system was shipped to Vina Kraft in Vietnam last week. Today, all team members enjoyed a lunch consisting of Chinese favorites to celebrate (there aren't any Vietnamese restaurants in our area). There were a lot of people involved in the process from securing the order to building and testing instruments and setting up profiles and shipping the equipment. The system will be installed next week. 4 awards from Thailand Corporate Excellence Awards 2015, including Human Resource Management Excellence which has been awarded for 14 consecutive years, Innovation Excellence which has been awarded for 10 consecutive years, Product/Service Excellence for 6 consecutive years and Leadership Excellence for 3 consecutive years. Thailand Corporate Excellence Awards is organized by Thailand Management Association (TMA) and the Sasin Graduate Institute of Business Administration of Chulalongkorn University. Nominees are selected by CEOs of 1,000 top companies in Thailand. SCG has been selected by the DJSI (Dow Jones Sustainability Indices) to be world's Industry Leader in Construction Materials for the fifth consecutive year. SCG has retained this prestigious recognition from 2011 and had been on the Gold List for eight years running from 2008 – 2015. Dow Jones Sustainability Indices (DJSI) is a security index that assesses and benchmarks sustainability performance of the world's leading companies and mutual funds from around the world. Those listed in the DJSI are screened for their ability to generate sustainable returns to investors. What is really happening when something fluoresces? Electromagnetic radiation at one wavelength is absorbed and is then re-emitted at a longer wavelength. Wavelengths of light correspond to perceived colors (if they fall in the visible range), and this means that shorter wavelength light like ultraviolet or blue is converted to longer wavelength light, like blue, green, yellow, orange or red. A Jablonski diagram (right) is typically used to illustrate the physics of fluorescence. In the diagram electronic (energy) states are indicated by bold horizontal lines. The thin horizontal lines above them represent vibrational/ rotational sublevels. Electrons are normally at the lowest energy state, indicated by S0. When a photon (indicated by the blue line entering from the left) with appropriate energy interacts with a molecule the photon may be absorbed, causing an electron to jump to one of the levels of an excited state (S1 or S2 in the diagram). By ‘appropriate energy’ we mean an amount corresponding to the energy difference between the ground and excited states. Thus not all incident photons are equally likely to be absorbed. 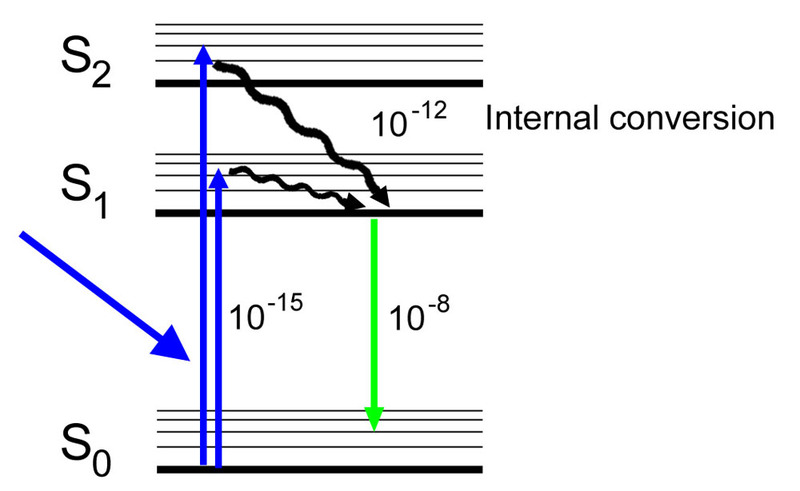 This transition process is very fast, on the order of 10-15 seconds (a millionth of a billionth of a second). 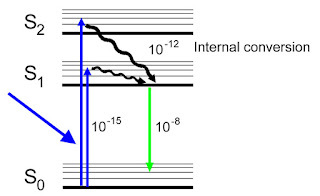 An excited-state electron rapidly (on the order of 10-12 seconds) loses its energy to vibration (heat), a process called internal conversion, and falls to the lowest level of the first (S1) excited state. From there the electron may fall to one of the sub-levels of the ground (S0) state, emitting a photon with energy equivalent to the energy difference of the transition. This happens on a time scale of nanoseconds (10-9 – 10-8 seconds) after the initial photon was absorbed. Since the emitted photon has less energy than the absorbed photon it is at a longer wavelength. This explains the magical process of fluorescence that converts light of one wavelength (color) to another, and leads to the phenomenal display of highly saturated colors in corals and so many other marine organisms. The probability that a photon will be absorbed varies with wavelength (energy). Even for those photons that are absorbed there are other processes that compete with fluorescence for de-excitation of the excited-state electrons. The number of photons fluoresced relative to the number absorbed is the quantum efficiency. The higher the absorption and quantum efficiency, the brighter the fluorescence. Principle of Fluorescence1. Energy is absorbed by the atom which becomes excited. 2. The electron jumps to a higher energy level. 3. Soon, the electron drops back to the ground state, emitting a photon (or a packet of light) - the atom is fluorescing. Another way to think about this is with the old model of electrons orbiting around the nucleus. In the ground (S0) state the electrons are in the orbital closest to the nucleus. When they absorb the energy of an incoming photon they jump to a higher orbital (S1, S2, etc.) or its sublevels. They can’t jump to the spaces between orbitals, and that is why not all wavelengths of light will make something fluoresce. The best way to document the fluorescence properties of a particular specimen is to measure excitation and emission spectra.